In a previous post I linked to Robert Smith? 's article on zombification. Inspired by Andrew Gelman's advice to "take a model seriously" I discussed the Smith? model on facebook with friends who are experts in zombification. We agreed that Smith? has confused several issues. First is that once a zombie has been "removed" by total destruction this zombie can not be reanimated, therefore a special class of fully removed zombies is required. In this same class would go the humans who die of natural causes too long ago to be zombified. While recently dead can be reanimated, skeletons can not. In addition, an important aspect of the zombie dynamics is that humans learn from encounters with zombies, whereas zombies do not. Finally, if there is anything we can learn from zombie movies, it's that the role of the elite zombie killers is critical, and by watching said movies we keep ourselves in a state of readiness to combat the zombies when they arrive. What do these new facts mean for our model? Let H be the human population and Z be the zombie population. We will normalize these to the total population, so that H+Z=1 initially. D will be the population of reanimatable dead, whereas G will be the population that is "gone" from the model, either by destruction of a zombie or by the members of D degrading to skeletons. Finally is the probability that humans win an encounter with zombies, and it will be a dynamic parameter that increases as zombies are destroyed. The G class (Gone) is our new completely eliminated class from whence no resurrection is possible. In addition, we have modified the Z dynamics so that we reflect the effect of the elite in the term . 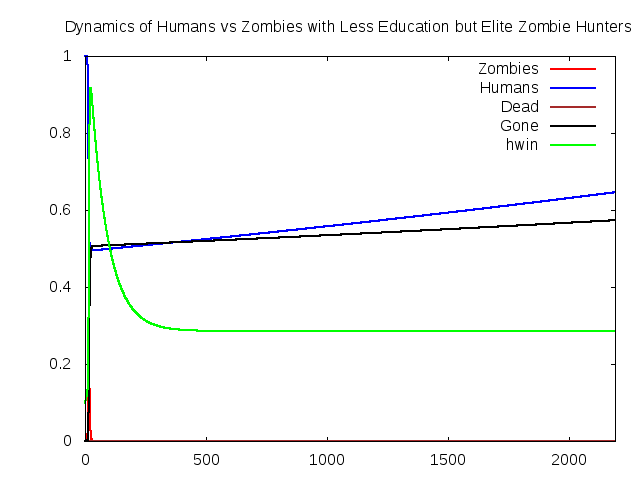 Since the zombie hunter elite are rapidly effective at low levels of zombification but have reduced marginal effectiveness, the reflects this nonlinear relationship between levels of zombies, and the effectiveness of the elite. In our new model due to the effect of rapid learning on the part of humans we can no longer assume, as Smith? has done that the entire dynamics occur over a short timescale. 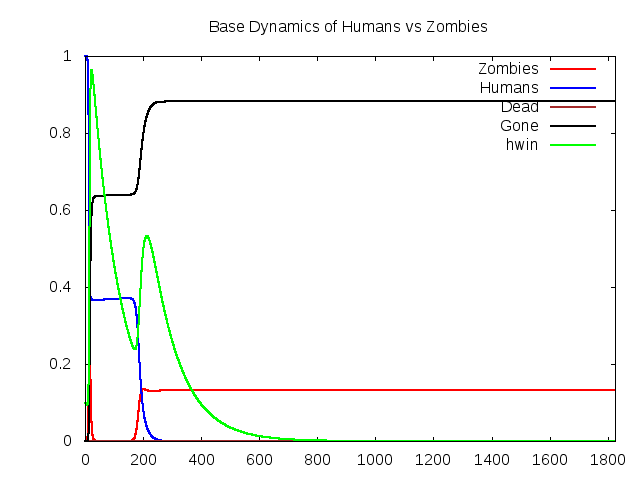 We are interested in solutions of the equations that show H growing in time at a rate of several percent per year as currently occurs in the absence of zombies, however when zombies attack, the dynamics are swift, so we will choose a timescale of 1 day, and a step size of .125, and plot our dynamics over several years. Here I have programmed the equations into Maxima, and used the dynamics package to solve them via the fourth order runge-kutta solver "rk". First, we estimate reasonable values for the parameters. We assume approximately 4.5 percent per year growth in the human population through a birth rate of 6.5% and a death rate of 2%. Resurrection from the dead is evidently a relatively rare event, we assume 1% per year. However rotting of the dead is much faster, perhaps 5% per day. Initially, the probability of a human winning a zombie fight is relatively low, perhaps .1 and initially our zombie population is quite low, perhaps 1 in 10,000. However the learning parameter is large. We use 3 in our graphs. 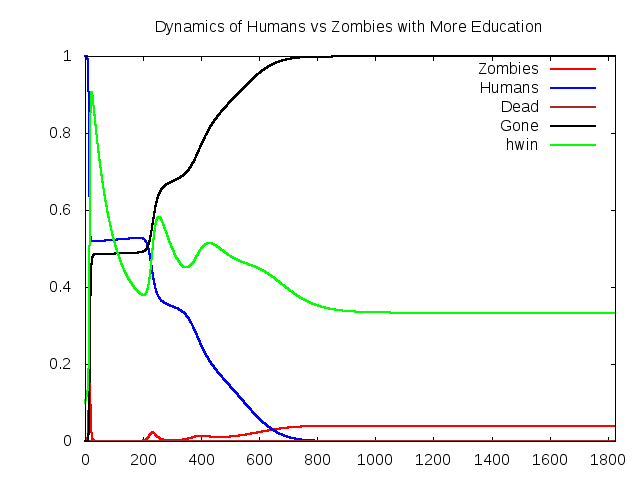 Finally, the skill of zombie killing decays at perhaps 1% per day in the absence of education. In the absence of a concerted effort to educate the public and provide an elite zombie hunter force, how will humans fare? In the absence of concerted efforts, humans valiantly defend themselves from two significant zombie attacks, but the lack of readiness ultimately overwhelms the humans as their probability of winning an encounter decays to zero rapidly. How will they fare when the education rate is .004, 40% of the decay rate? Evidently, the education and readiness improves things, as the humans survive two waves, but are overwhelmed by the final wave. Perhaps more education will help? 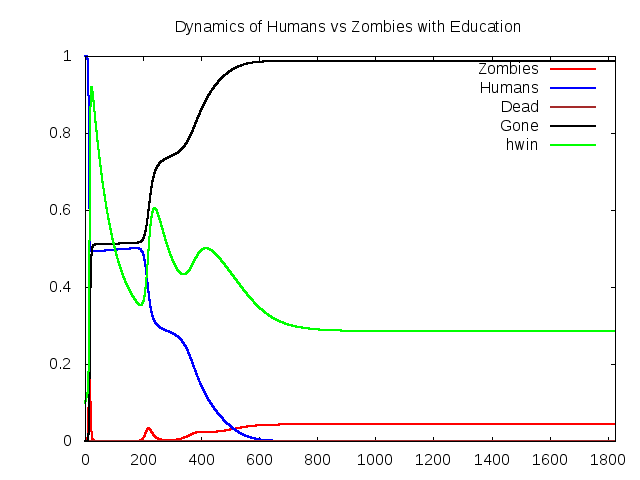 If the education level is high enough, zombies will be defeated, but it is unreasonable to believe in such high levels of education, when education rate is .005, 50% of the decay rate will the humans survive? Although we can not reasonably expect large numbers of people to maintain vigilance in zombie destruction, perhaps an elite force of zombie hunters can prevent zombies from returning in waves? Setting the elite force to 4/10,000 people, and dropping the education rate back to 40% of the decay rate seems a reasonable goal, will it succeed? 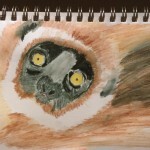 What have we learned from this exercise in nonlinear dynamics? Clearly, Hollywood plays a vital role in educating the public about the proper response to zombie infestation. To safeguard the public, perhaps the NIH should immediately begin funding the production of zombie movies? However, with the cost of producing zombie movies rising higher every year, it is essential to employ the elite zombie hunter forces that zombie movies and nonlinear dynamics have taught us the importance of. The Department of Homeland Security should move rapidly to protect the public from zombies through training and deployment! Even in the presence of the zombie hunter elite and educational zombie movies, we fully expect the city where an initial outbreak occurs to lose almost half its population! There can be no delay in maximizing our readiness! Very interesting read and it proves a point that I have been repeating for the past 10 years: Zombies can be a danger if people are not properly trained. While zombies movies are good at educating the population at large about the basic principles (ex: always double tap & watch the back seat), I think the training of a proper Zombie hunter elite would have more success if it is done with video games. These games are much more cost efficient and targets people who have a high zombie infestation survival profile (gamers never leave home, so less chances to be infected). I have to say that this is probably the most scientific zombie information... ever. Thank you for writing such an awesome article and preparing us all for the coming zombie apocalypse. http://www.zombieinformer.com We'd like to post something about this on our site. 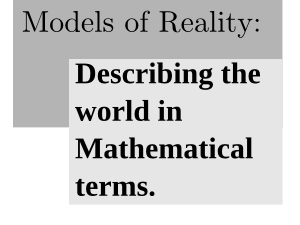 I don't want to sound picky, but there is an error in your model. A term should appear in to account for the zombies killed by the elite team. This may or may not change your conclusions. But, of course, the more pressing issue is to confront your model with reliable empirical data. Are we going survive the next zombie attack? Yes, I see, you're absolutely correct. The only change this will make is to prevent my model from losing zombies, since the zombie killers remove zombies into the "gone" group, they can not be reanimated so their loss doesn't change the dynamics. As to the question of whether we can confront the model with reliable empirical evidence, all the best documentary movies on zombie attacks reproduce the basic dynamics of this model: zombies come in waves, the humans become more and more adept at killing them, and the small band of remaining zombie survivors are always saved by elite teams of highly trained government commandos.